80% of people are surfing the internet on mobile devices like cell phones & tablets, and they leave websites that can’t be easily viewed on their device. A website that’s more than 2 years old may not be Responsive. 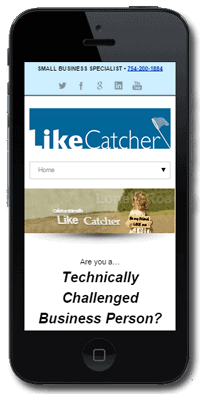 LikeCatcher specializes in responsive web design. A responsive web design site automatically changes its layout to match the users device screen size, and be easily readable on any computer, tablet, or smartphone. Call LikeCatcher for a free review of your current website at 754-200-1884, and ask how a responsive web design can help you. Responsive Web Design is HUGE! 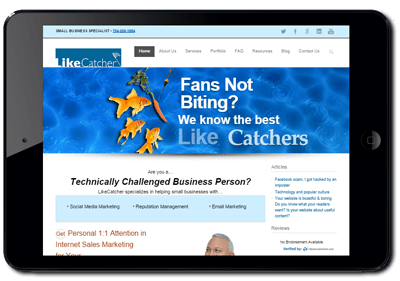 LikeCatcher Specializes in websites Actionable, with a specific Call To Action. People visit websites is for granular information. The who, what, where, why, and when. They want to find something out, learn something new. Everyday people are investigating websites before making a purchase from a business, professional, or product… or acceptance a new idea. or education value for visitors. Limited Time Offer… Order today! If this makes good business sense to you, click the contact button below for a free overview of how you are perceived online.